Two more operand types are defined to provide ‘short’ types for use by languages other than Limbo: signed 16-bit integers, called ‘short word’ here, and 32-bit IEEE format floating-point numbers, called ‘short float’ or ‘short real’ here. Support for them is limited to conversion to and from words or floats respectively; the instructions are marked below with a dagger (†). Data memory is a linear array of bytes, addressed using 32-bit pointers. Words are stored in the native representation of the host CPU. Data types larger than a byte must be stored at addresses aligned to a multiple of the data size. A thread executing a module has access to two regions of addressable data memory. A module pointer (mp register) defines a region of global storage for a particular module, a frame pointer (fp register) defines the current activation record or frame for the thread. Frames are allocated dynamically from a stack by function call and return instructions. The stack is extended automatically from the heap. 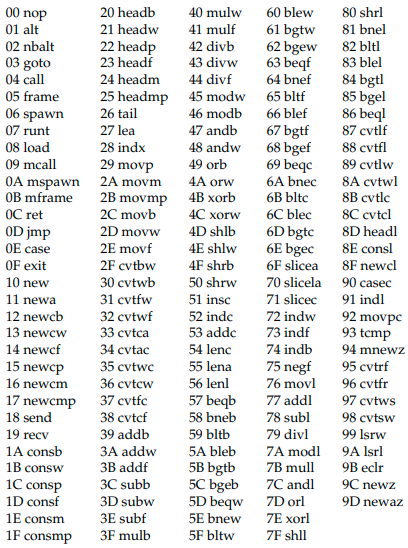 The indc instruction indexes Unicode strings. The src1 instruction must be a string. The src2 operand must be an integer specifying the origin-0 index in src1 of the (Unicode) character to store in the dst operand. The insc instruction inserts a character into an existing string. The index in src2 must be a non-negative integer less than the length of the string plus one. (The character will be appended to the string if the index is equal to the string’s length.) The src1 operand must be a string (or nil). The character to insert must be a valid 16-bit unicode value represented as a word. The nentries value gives the number of entries in the table and can be zero. It is followed by that many linkage entries. Each entry is aligned on a word boundary; there can therefore be padding before each structure. The entry names the imported function in the UTF-encoded string in name, which is terminated by a byte containing zero. The MD5 hash of the function’s type signature is given in the value sig. For each entry, load instruction checks that a function with the same name in the newly loaded exists, with the same signature. Otherwise the load will fail and dst will be set to H.
The entries in the linkage descriptor form an array of linkage records (internal to the virtual machine) associated with the module pointer returned in dst, that is indexed by operators mframe, mcall and mspawn to refer to functions in that module. The linkage scheme provides a level of indirection that allows a module to be loaded using any module declaration that is a valid subset of the implementation module’s declaration, and allows entry points to be added to modules without invalidating calling modules. The movmp instructions performs the same function as the movm instruction but increments the reference count of pointers contained in the data type. For each pointer specified by the src2 type descriptor, the corresponding pointer reference count in the destination is decremented. The movmp instruction then copies memory from the src1 operand to the dst operand for the number of bytes described by the type descriptor. For each pointer specified by the type descriptor the corresponding pointer reference count in the source is incremented. All binary values are encoded in two’s complement format, most significant byte first. The data_size gives the size in bytes of the module’s global data, which is initialized by evaluating the contents of the data section. The middle_data field is only present if the middle operand specifier of the address_mode is not ‘none’. If the field is present it is encoded as an OP. The source_data and dest_data fields are present only if the corresponding address_mode field is not ‘none’. For offset indirect and immediate modes the field contains a single OP. For double indirect modes the values are encoded as two OP values: the first value is the register indirect offset, and the second value is the final indirect offset. The offsets for double indirect addressing cannot be larger than 16 bits. The byte, word, real and big operands are encoded as sequences of bytes (of appropriate length) in big-endian form, converted to native format before being stored in the data space. The ‘string’ code takes a UTF-encoded sequence of count bytes, which is converted to an array of 16-bit Unicode values stored in an implementation-dependent structure on the heap; a 4-byte pointer to the string descriptor is stored in the data space. The ‘array’ code takes two 4-byte operands: the first is the index of the array’s type descriptor in the type section; the second is the length of the array to be created. The result in memory is a 4-byte pointer to an implementation-dependent array descriptor in the heap. Each item’s data is stored at the address formed by adding the offset in that item to a base address maintained by the loader. Initially that address is the base of the data space of the module instance. A new base for loading subsequent items can be set or restored by the following operations, used to initialize arrays. The ‘set array index’ item must appear immediately following an ‘array’ item. Its operand is a 4-byte big-endian integer that gives an index into that array, at which address subsequent data should be loaded; the previous load address is stacked internally. Subsequent data will be loaded at offsets from the new base address. The ‘restore load address’ item has no operands; it pops a load address from the internal address stack and makes that the new base address. The pc is the instruction number of the function’s entry point. The desc_number is the index, in the type section, of the type descriptor for the function’s stack frame. The sig word is a 32-bit hash of the function’s type signature. Finally, the name of the function is stored as a variable length array of bytes in UTF-8 encoding, with the end of the array marked by a zero byte. The names of member functions of an exported adt are qualified by the name of the adt. The next linkage item, if any, follows immediately. 1. Inferno Programmer’s Manual (Third Edition), Volume 1 (‘the manual’), Vita Nuova Holdings Limited, June 2000. 2. P Winterbottom and R Pike, ‘‘The Design of the Inferno Virtual Machine’’, reprinted in this volume.